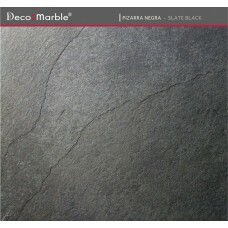 Home > Cosentino®>Scalea®>Slates>Black Slate 60x30x1 cm. Devoid of accent colors, Black Slate is unwaveringly solid and dark with a ridge like striation. Finish: Natural calibrated. Rear and side slab or calibrated natural finish Tiled view. Recommendations: BLACK SLATE is widely used in applications veneer for indoor and outdoor areas for environments from rustic to minimalist. Its non-slip properties make it very suitable for applications in bathrooms. When cleaning, use non-aggressive products. Formats Available Standart tile: 60 x 30 x 1 cm. | SLAB on request: The standard slab size: 200 x 100 cm. | Thickness: 20 / 30 mm.